When Olympus and Panasonic announced their new Micro Four Thirds standard in early August, everyone expected Micro Four Thirds to quickly make its way to point and shoot cameras. That will still likely happen as there are many advantages to using the comparatively huge Four Thirds sensor in P&S cameras to break them out of the technology wall imposed by current resolutions on the tiny P&S sensors. 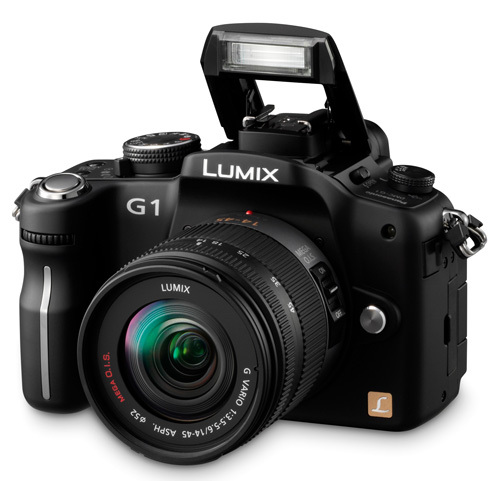 What was not foreseen was a Panasonic G1 Micro Four Thirds system camera with top-drawer features, 12MP Live MOS sensor, and a 3" tilt-and swivel LCD like the one featured on the Olympus E-1. Most assumed Olympus was the driving force behind Micro Four Thirds, but now it appears Panasonic pushed this standard to market. In many ways this move really makes sense as Panasonic, who is a major player in other optical imaging, has a miniscule market share in the DSLR market, with DSLRs featuring Leica optics that mount on Olympus/Panasonic Four Thirds mount. It is no secret Panasonic makes the Olympus sensor as well as their own, and Panasonic would dearly love a much larger share of the sensor market than they now have. Sony is their major rival in other optical markets and Sony is dominant in the digital sensor market with only Canon as major competition. Panasonic wants a larger piece of that pie. There is a detailed review at the following site. It is compared with Nikon D90/D60, Olympus 520, Canon Rebel XSi(450). The Iraqi scientists in tha basement almost have the ZuneCan ready. Don't be too hastey about getting one of these things! Now the only question is whether their integrity is compromised by the ownership. At the very least, they have an effective monopoly on digital camera previews, which is rather disconcerting. What I don't understand is why the camera companies don't want other sites to get in on the action. It's almost like they're stuck in a pre-digital world trying to figure out how to cope with the internet. Marketing: "Hey, we should send out a bunch of camera samples to web sites. They'll provide reviews, which are essentially free advertising! All it costs us is shipping plus the hardware, which is a damn sight cheaper than any other form of advertising (and more effective to boot)." Thanks for your comment. You certainly understand our frustration in trying to get camera info and samples to review. Frankly we have asked every manufacturer repeatedly, but we have yet to review even ONE camera provided by a manufacturer. We have been buying the cameras wherever we can as fast aswe can and then reselling them after review. The manufacturers keep saying nice things over the last two years, but none of them has ever delivered anything for review. It is still pulling teeth just to get on and remain on, press release lists. This is certainly totally unlike our presence in the computer market and it can be quite frustrating. I think it would help manufacturers have a greater trust in the sites review abilities if there was some sort of standard you guys came up with when reviewing them. Resolution cards, constant scenes in consistent lighting that can be taken to show differences in different ISO settings to build a database against other cameras. It has not seemed yet like the reviews have any sort of constants to compare other reviewed cameras here against. Color, sharpness, noise true resolution ect ect. One can put the coolest name they want on their image processor but the outcome is what matters, and it’s too hard to compare totally different scenes with the help of impractical numbers. Controlled consistant scenes + onmouseover images for the review itself = your friend. I don't like any previous EVF I have seen, but I'll reserve judgement on this until I have actually looked at one. The DPR preview said it got grainy when gained up a lot at night, have to see how bad that really is compared to an optical viewfinder. Same with the autofocus - they say it is fast, but I want to see how fast and accurate it is. SLRs typically have a registration distance of around 40mm, this halves that to 20mm. So anything wider than 20mm (which isn't wide on 4/3) will be retrofocal, and to beat the current widest rectilinear lens (Sigma 12-24 on film/FF digital) they will need a lens wider than 6mm.
" In the digital world, with live view screens showing the actual sensor image even more precisely than most optical DSLR viewfinders"
Except electronic viewfinders bring their own parcel of problems. I just wish they'd stop with the half-assed semi-DSLR body shape and size, and go straight for a very compact, rectangular rangefinder size mobody.